Insurance regulators and commissioners have a demanding job. Every day is filled with a steady stream of demands from insurers combined with the ever-present need to satisfy all the other constituents. These regulators have long recognized the importance of compiling data consumers can use to identify the best insurers. Measuring performance, compiling the data and presenting the results in an easy-to-understand fashion for consumers has been the step insurance regulators have desired to take for years. This process is, however, complicated. Getting 50 autonomous regulators to conform to a single methodology is all but impossible. ValChoice is here to help. With an effective grading system, consumers are able to identify with insurance companies based on their values and business practices and insurance companies are able to differentiate their product and build longer, more trusting relationships with customers. Producers are able to offer the best products, also building stronger relationships with clients. All this leads to a stronger, healthier industry. Having achieved the goals of developing analytics to characterize performance and presenting the analysis in an easy-to-understand format, the next step for ValChoice is to expand the industry participation to include insurance regulators and insurance companies. 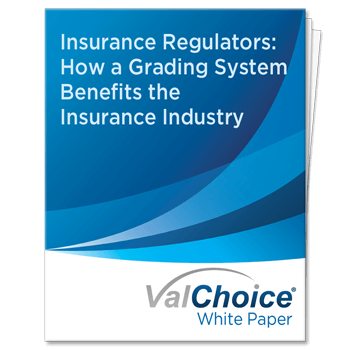 To learn more about how to collaborate with ValChoice, download the Insurance PDF (white paper) below. Collaboration will lead to more satisfied consumers and a healthier insurance industry. A grading system that brings transparency to the industry provides a natural method for balancing the demands of the regulators different constituencies. Download this free insurance PDF outlining how we can work together to benefit your constituents.